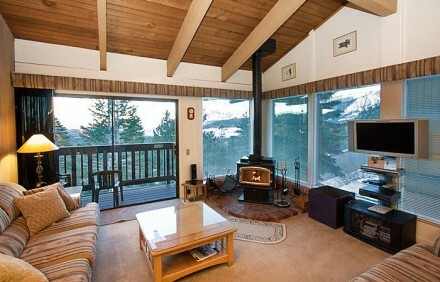 Mammoth Point condos for sale are located at 94 John Muir Road, Mammoth Lakes, CA 93546. This 36-unit complex was built in 1972 and offers two floor plans: 2-bedroom, 2-bath with approximately 1,055 square feet or a 4-bedroom, 3-bath with approximately 1,552 square feet. Many of the units on the front row of the complex offer breathtaking down valley views towards the east of Crowley Lake and the White Mountains. Enjoy great sunrises and amazing sunsets reflecting on the distant mountains from these townhomes! For those who are looking for a true mountain experience, the Mammoth Point condos complex offers a great peaceful forest setting with amazing views. The complex is located very close to Canyon Lodge. The steep street to reach the complex is very well-maintained in the winter months and snow removal is prompt and efficient. However, if you plan to pursue a condo purchase at Mammoth Point, a 4WD vehicle is a must. Listed below and updated daily from the MLS are condos for sale in Mammoth Point, a condo development located in Mammoth Lakes, CA. For additional information on any of these Mammoth Point condos for sale in Mammoth Lakes, click the "Request More Information" button when viewing the details of a property. We can provide you with disclosures, past sales history, dates and prices of condos recently sold nearby, and more. And, be sure to register for a free account to automatically receive email listing alerts whenever new Mammoth Point condos hit the market in Mammoth Lakes, CA, that match your specific search criteria.